Would you like a packet of seeds with that book? 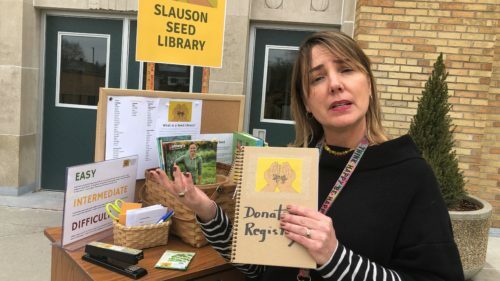 That’s a reasonable question at Slauson Middle School now that a new Seed Library cart is available to students, staff and parents who’d like to check out some seeds to sow. The seeds are arranged in an old card catalog, which is on wheels so it can be rolled outside for sharing seeds as students exit the school at the end of the day on Wednesdays in conjunction with Garden Club. Patrons are encouraged to take seeds, share their experience, and—when able—donate seeds collected from plants. A number of individuals and organizations donated seeds, including ACE Hardware, Agrarian Adventure, and the Project Grow Seed Swap. Parent volunteers Katya Angelova and Sandy Ellender helped with getting the seed library up and running. Student volunteers Devyn Botero and Jodeci Niedzielski helped sort the seeds to weed out any genetically modified organism (GMO) seeds. Devyn said she’s excited about the library, and was happy to sort the seeds because she’s very concerned about GMOs. “This will help other generations learn more about it,” she said. Devyn Botero hopes more students become aware of GMOs in their diet, and the importance of seed diversity. 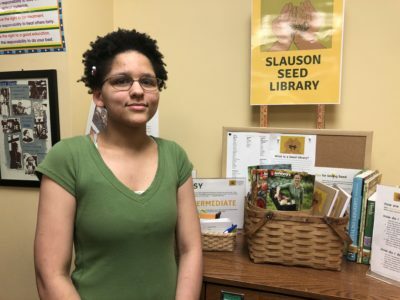 Information about the Slauson Seed Library, including resources on gardening, seed libraries in the area, and saving seeds can be found here. on the Slauson Seed Library website page on the Slauson Library Website.